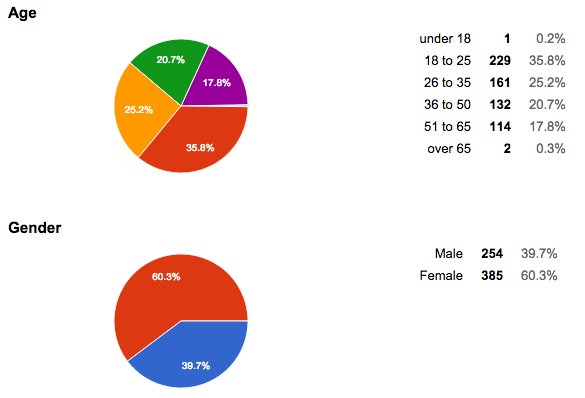 First, the demographics are mainly a reflection of Craigslist users, but there you have it for context. Next were some additional contextual questions about how people use the health care system. Who are the lucky one third of people who don’t get sick in 6 months? On the other hand, almost a quarter of people have been or have a child who has been hospitalized in the last 6 months? That seems pretty high to me when you consider the per capita hospitalization rate is 10-15% in a year. Maybe there is some Hawthorne effect going on here or maybe that is an accurate reflection of an average 2-3 people per household? 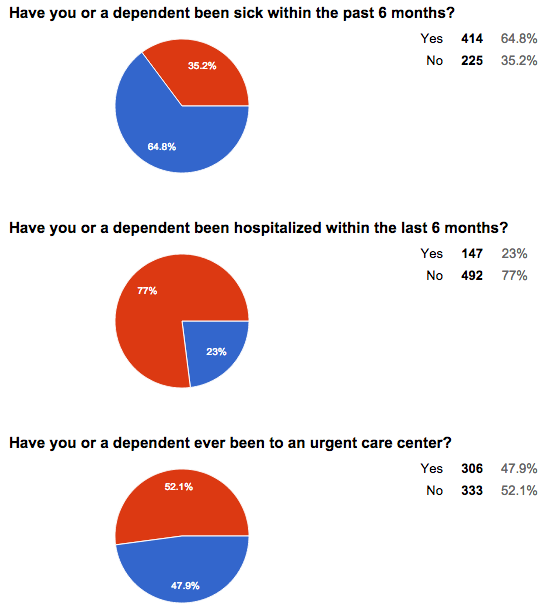 It’s not clear to me how to interpret the last question on urgent care centers since that is total jargon which we did not define. These questions I find most interesting. More people say they get medical information from the Internet than their doctors. Virtually no one uses nurse advice lines despite a big push in the 90s – 00s. A lot of people have used WebMD’s symptom checker, which is not at all surprising given people’s answer to the last question. 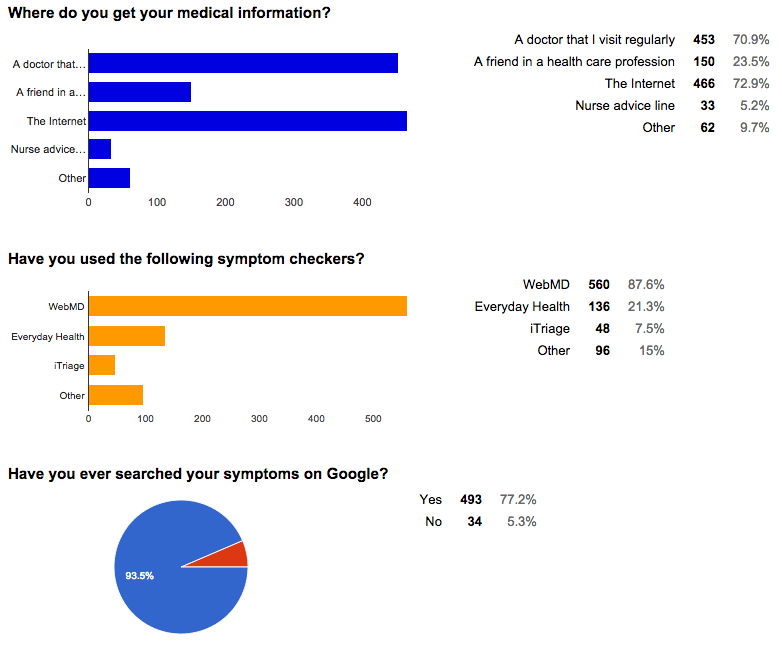 5% of people (in this group) have never searched their symptoms on Google (with some not answering the question). That seems about right. In any case, WebMD does very well in the SEO game and so if you’re Googling symptoms, you’re going to come across their symptom checker. The use of other symptom checkers grossly resemble the click-through rate decay observed for Google rankings. Finally, a lot of headaches on the Internet apparently. That’s probably about the type of symptom I would hope to see. 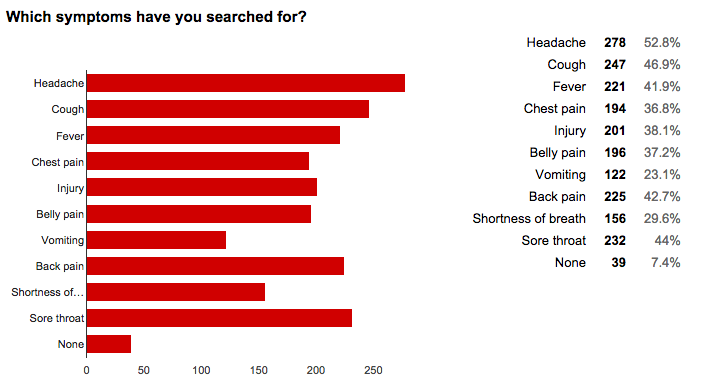 I’m a little surprised by the amount of people looking up vomiting, but I guess this gets at the fact that what people choose to search is a complicated interaction among being concerned (but not too concerned), not knowing most common causes for that symptom, and knowing how to put symptoms to words. There you have it. Hope you found that as interesting as I do. It would be fun to repeat this. I’ll let you know if I do.